Dinosaurs are endlessly fascinating, especially to young children. And this Big Book of Aussie Dinosaurs is perfect for small dinosaur fans. With exciting page headings such as Attack! and Dinnertime! Children will be flipping through the pages to discover all the facts and legends attributed to these prehistoric creatures. 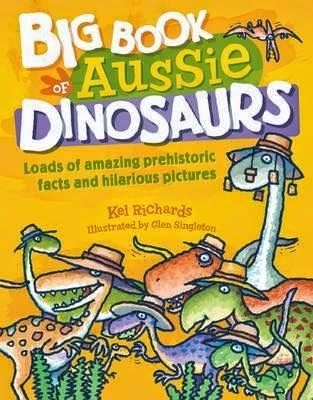 Focussing on the dinosaurs who roamed Australia, this fabulous book talks about the fastest, slowest, oldest, youngest, biggest and smallest Aussie dinosaurs. The author compares them to animals such as chickens and whales so his young audience will understand comparisons immediately. The text is humorous and informative and there is a gallery at the back of the book to help with pronunciation of dinosaur names and what they mean. There is also a small section explaining how we know what we know about them. A large hardcover, this book is a great size for little hands. The short nature of picture books means the bites of information about each dinosaur is just right for the focus of the very young. The humour in the text is emphasised in the illustrations. Bright and attractive, they hook the reader in straight away. They also give added meaning to the facts in fun and silly ways. A Skartopus is scaring a postman, a Muttaburrasaurus with its round snout perfect for smelling with holding a very stinky sock, and Australia's youngest dinosaur, Wintonopus, holding balloons and a birthday cake with one candle. Big Book of Aussie Dinosaurs is entertaining, informative and easy to read and understand. A must for young dinosaur fans from 4 years and up.